Sorry to miss the usual end-of-the-month target for a fresh post, but yesterday was our son’s 18th birthday. Pretty big day. When I turned 18 in the summer of 1975, that was the drinking age in Wisconsin. That I could go out to an old tavern and be introduced to John Prine’s music by a friendly, long-haired folk singer on a tiny stage, well, that’s just one of my great memories. The drinking age is 21 now, but I’m sure Evan will have plenty of coffeehouse and rathskeller and student lounge performances to explore when he goes off to college in the fall. Maybe he, too, will learn of the wonderful Chicago folk singer John Prine in that manner. In fact, the only time I saw John Prine was on the UW-Green Bay campus, where Evan will be going. This was the record I bought into when I started learning about John Prine. It’s been one of my favorites all these years. I dug it out a couple of weeks ago when Pauline Phillips, the woman who wrote the “Dear Abby” column, passed away. Prine wrote a typically irreverent, light-hearted song about Dear Abby in the early ’70s. It’s one of the songs on one of my favorite album sides, the one shared here tonight on The Midnight Tracker. 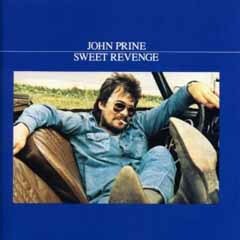 “Sweet Revenge,” “Please Don’t Bury Me,” “Christmas In Prison,” “Dear Abby,” “Blue Umbrella” and “Often Is A Word I Seldom Use,” John Prine, from “Sweet Revenge,” 1973. This is Side 1. It runs 19:17. It’s out of print but is available digitally. A guy could learn a lot from John Prine, especially a college guy. Yeah, let’s hope we don’t hear that anytime soon. This entry was posted on February 1, 2013 at 4:35 pm and is filed under February 2013. You can subscribe via RSS 2.0 feed to this post's comments. I discovered Prine in 1982 on TV (of all places) as I saw a PBS documentary on him and his music. I’ve been a fan ever since.